This has been quite a week, hasn’t it? Though my own personal corner of the world is fine at the moment, it sure does seem as though the news has been exceptionally full of sadness and strife over the past little while. Perhaps that’s all the more reason to take a few minutes to stop and focus on gratitude… even, in some cases, for the blessings that come in spite of the bad. Hope you’ll join me in this week’s Gratitude Linkup! 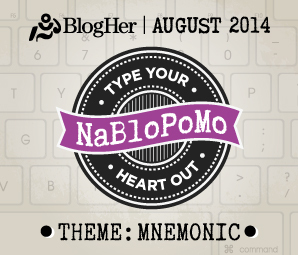 Write and post an entry in your own blog containing your gratitude list for a moment in time. Share the URL to your gratitude blog post by clicking the “add your link” button at the end of this post and filling out the information. Share the Gratitude Linkup with your blog readers by clicking the “get the InLinkz code” link at the end of this post and copy/pasting the appropriate code into your gratitude blog post. 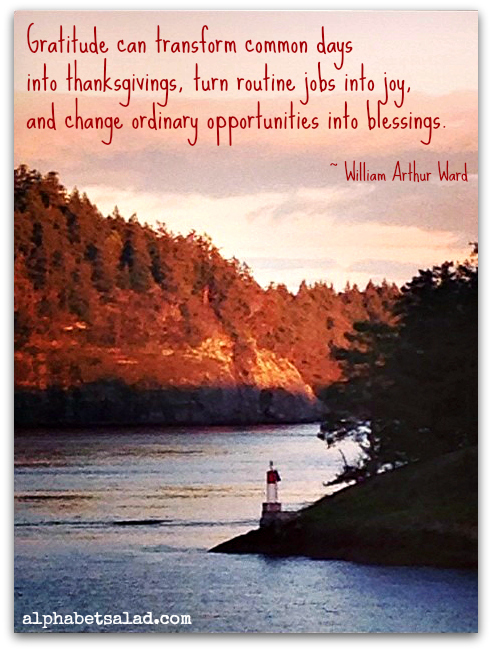 Visit some of the blogs listed in the Gratitude Linkup and comment on their posts. In no particular order, here is my own gratitude list for this moment in time. I hope that after reading it you’ll go on to write and share your own! The incredible talent Robin Williams shared with the world, and the legacy he left behind. While it’s difficult to think of gratitude connected with the tragedy of a person taking their own life, in this case I’m grateful for the dialogue this has opened up about depression and mental illness. May those discussions continue, may the stigma be removed, and may suffering people be helped and saved. That I was able, many years ago, to find a treatment that works to keep my own depression in check. That our company’s benefit plan covers prescription drugs 100% so that I don’t have to make the choice between groceries and mental health. That through my experience with this disease I’ve gained a kernel of understanding as to what others go through. The reward of losing 3.5 lbs after a good, on-track week. Another successful week of healthy eating, drinking enough water, and fitting in some exercise every day. My sense of hearing, and the ability to enjoy all the natural sounds outside my window: crickets, cicadas, birds, squirrels, water, wind, rain, thunder. Good things in my friends’ lives that bring them happiness. Good, practical things that come into my own life because of blogging and my commitment to it – for example, our new ActiFry. We’ve enjoyed some amazing meals over the past couple of weeks – plus, I never would have imagined being able to make a snack of French fries at home at 10:30 p.m. (let alone being able to fit them into a healthy eating plan), but we did it! This week, I am grateful that I have found the courage to speak up even when I know my ideas are not going to be popular. There is something every day, every minute to find something to be thankful for. It really does, Emily. 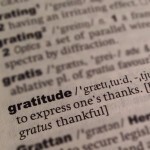 Thank you for sharing your gratitude list! Congratulations on the 3.5 lbs!!!! Great list, I’m thankful for a wonderful day of canoeing with my mom, 2 brother, SIL and hubby! It was terrific and a rare occasion! Rena McDaniel recently posted… WHAT IN THE WORLD IS EHLERS-DANLOS SYNDROME? Thank you! And thank you for sharing your list – sounds like fun! Thank you – I hope you do! It has been such a roller coaster week of emotions. I am also glad my insurance therapy sessions. Congratulations on the 3.5 pounds!! I am on a similar road and it isn’t always easy but I do feel so much better. So much to be grateful for. All we have to do is look. How’s the Actifry coming along? It’s wonderful, Vidya – such a great little appliance, and I’m so grateful to have it. Such an optimistic post- our life’s happiness is made of small and big positive things around us. And your gratitude list proves it so well. Like you said acknowledging the ability to enjoy all the natural sounds outside my window: crickets, cicadas, birds, squirrels, water, wind, rain, thunder or even a friend’s happiness gives that blissful feeling. Sometimes even the small things are enough! My hasn’t it been an incredible week. There are so many things to always be grateful for. I’m so very grateful to even know gratitude and what it means and brings into my life. I liked yours so much that I came up with mine. Laurel Regan recently posted… World Organ Donation Day: Are you registered as an organ donor? Are you SURE?